Today was our last day to spend with the church and church members. In the morning, we split up, Leisel and I went sledding with Masha (Maria) down by the Volga River. We walked around the park, and down to the Volga, where we –safely- walked out on the frozen water. While we goofed around in the park, Jay went to the hospital with Pastors Natalia and Olga to visit and pray with Tamara, who was the Headmistress at the orphanage. Tamara has been very sick, but was lifted to see Jay and hear the love that had been sent by people back in the United States. We met up again a little after noon and headed out for lunch with Vlad, Natalia, Olga, and Masha. We went to a café where we had very large potato cakes and bellinis stuffed with various other foods like ham, cheese, cinnamon, cherries, chocolate, apples, and so forth. Conversations drifted around the table, in Russian and English. We talked about what we were going to do the rest of the day, as well as the next. We were prompted by each other to try all the different pancakes that had been ordered, and ended up with some left overs. After lunch, we went to a craft fair, where one of the members of Samara UMC had a booth. We looked around and also learned how to make wool birds. After spending a good hour and a half looking at all of the handmade trinkets, we took the tram with Natalia, Olga, and Masha to the church. When we got there, we started setting up to make s’mores with the kids at the church. 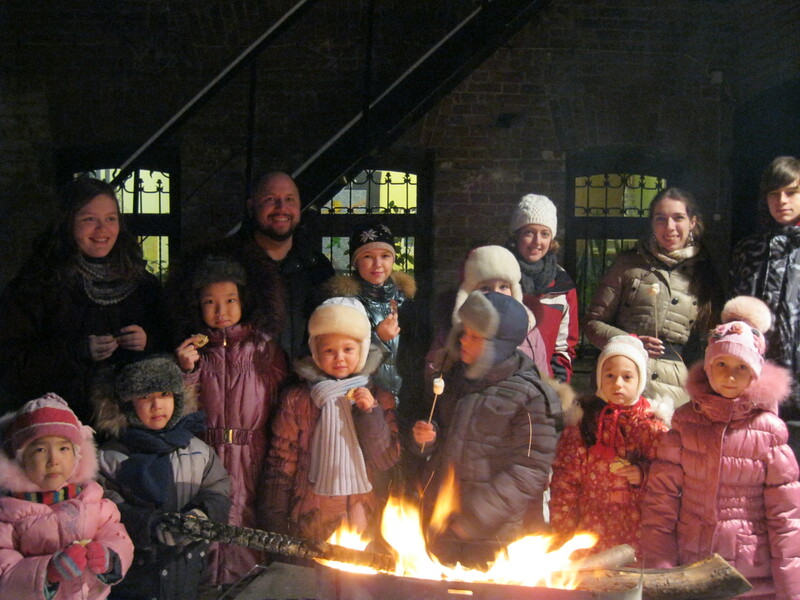 Now, Russia does not have marshmallows, and some of the adults had seen them before in America, but we showed them how to make s’mores, and they had a blast. After a while, they brought out sausages and started roasting them as well. After the s’mores adventure, we took part in the leadership meeting for Samara UMC. The meeting was to help them figure out how to make leadership in the church work, and how they can make the organization of the church better. They have pointed out there is still a lot to be done for the church, but that the conversation helped them with planning ahead for the future. At dinner Pastor Natalia explained to everyone how to make a sandwich, because they had a buffet-style dinner, which is contrary to how they usually eat. The people at the meeting sang some praise songs, which even if we didn’t know the words, were still beautiful all the same. When everything was said and done, there were many hugs and pictures. We thought we may not be able to leave the church, because they just kept providing hospitality and love, which is something I think all people should strive for, because there are a great many perhaps in life, but one thing that will always stand out crystal clear is the love and hospitality provided by people, through common bonds. Fellowship is really, really important. Back home, Sundays feel special. Waking up to the Sabbath day in Samara inspired an especial joy. This is the day God hath made ~ let us rejoice and be glad in it! Soon after waking to Jay’s alarm-clock-of-a-knock, my joy was tempered by plans for showering – a task so challenging I’ve reserved its use for once every two days. Hot water is available in limited supply; a handheld showerhead and close shower stall further complicate the process. If you have spent more than 2 minutes in a steaming shower, bathed daily, or flushed your toilet paper lately, consider the luxury of American plumbing. I don’t mean to sound petty… but I miss my bathroom. Samara UMC is housed in what appears to be an older, historic part of the city. The church inhabits every inch (meter?) of its space, from a basement café-style gathering place to the ground floor meeting rooms, above to the second floor sanctuary, offices, and guest accommodations. If a congregation is a family, this church is a dynamic, inviting home that opens as if to say, “Please come, and stay for a time.” The warm, inviting presence that met us at the door this morning may only be described as radical hospitality; theirs is a hospitality so powerful that I find myself struggling to accept it. The generosity we’ve been shown by the good people of Samara UMC inspires me with a pressing desire to be more generous myself, and more loving, and I think this is how fellowship stands to help us all grow in our faith. We learn by the example of others how to put our faith into practice in the world. 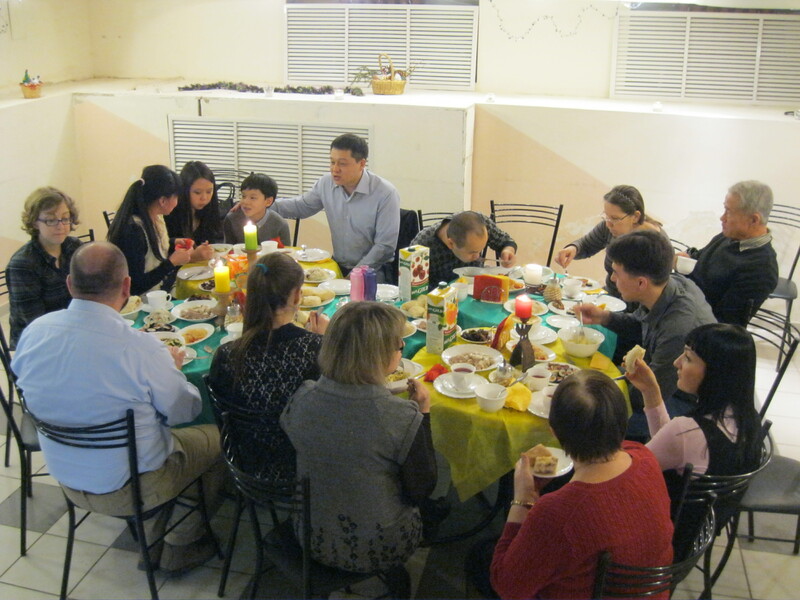 Here in Samara, I sense the depth of God’s grace through the kindness of our church family. Jay delivered a sermon on Isaiah 43:18-19, celebrating the new thing – the new horizon – God has prepared for us. A new year, new relationships, new directions, new possibilities, and each day we ask ourselves not if but where God may have us begin. Though Russian and English languages share very few correlates, ‘Amen’ is a beautiful exception requiring no translation. Words can not begin to express the joy that we shared with children today. Our simple introduction into the lives of the orphans allowed for interaction that overcame the barrier of language. As in previous years, curiosity and uncertainty began the day while we shared names and the children desired to share more information, but realized our command of the Russian language poorly lacked. Coloring and games of thumb wars broke the ice on what would become a progressive adventure into relationship. Later the children became more animated to show us their acrobatic skills, which were astounding, and encourage our physical interaction. As usual, turning my camera over to the children brought great joy and some amazing images. We are dearly thankful for the kind supporters who have allowed us this opportunity to share the love of Christ and God’s care that has encouraged our faith and cared for our travel. We spent our day at the orphanage with the youngest kids there. In the morning we went to the sewing class, instructed by a woman named Tamara. The class was mostly the older girls (14-16) and was very small. We helped make fleece tie pillows for the girls as we attempted an English-Russian conversation. 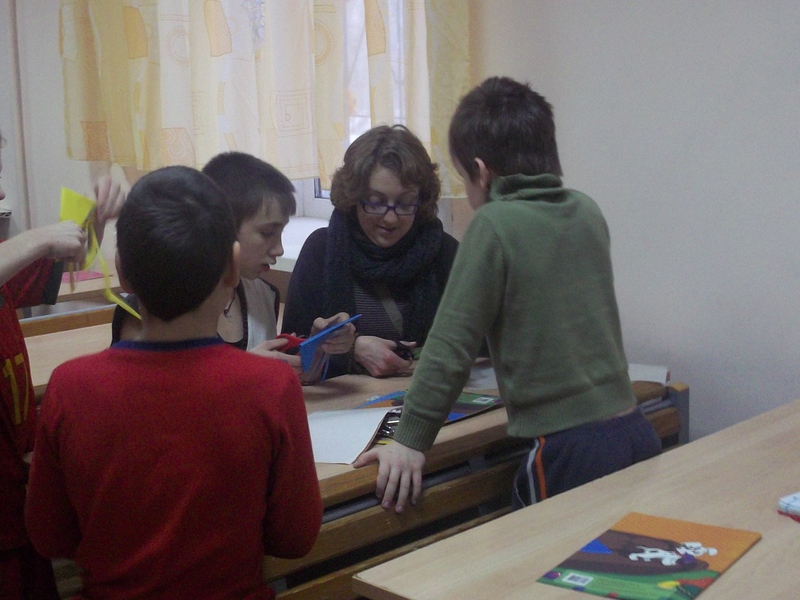 They told us about themselves, and tried to say as much as they could in English, with some help from our wonderful translator, Masha. While we were helping, the girls tried to learn how to say ‘This is a present for you’ so they could give us the pillows they made. Four of them gave us pillows they otherwise would have used in their rooms. It is very humbling to receive a gift from someone who has so little to begin with, but then for them to give you something that would mean more for them, shows how much hospitality these kids have. You learn a lot from spending time with people who lack a majority of what we have in our lives, and it shows you how much the simple, small things, matter most. Because when you think about it, we could live a full and healthy life without a lot of what we have, but we do not think so, because we are so used to having all of that stuff to assist us in our day-to-day lives. In the afternoon we went to the gym in the orphanage, where Pastor Natalia organized games to play with the group of young boys we got to know the day before. Despite the language barriers, games and play were an absolute blast. After finishing the games Pastor Natalia organized, we had free play time in the gym, during which we played various games together, creating an even stronger bond with the kids. The energy these kids exhibit did not diminish once while we played, they continued to create new games to play with us, whether or not we knew exactly what we were doing. Even though, by our standards, their care is poor, they are still the happiest people I have ever met. They are incredibly athletic and love to run around. Whilst playing in the gym with the kids, we were able to understand the incredible relationship that the United Methodist Church in Samara, Russia has with the orphanage and the kids. Even though there are a lot of what-ifs and unknowns for the church, the orphanage, and their relationship, the presence of faith, hospitality, and God, are astoundingly present with these amazingly wonderful people. I get anxious just thinking about planes. I have an aversion to cold temperatures, adhere to a vegetarian diet, and demonstrate not the slightest appreciation for Russian culture nor aptitude for the Russian language. * In sum, these many factors suggest I am among the unlikeliest of candidates to participate in this year’s UMC West Ohio Conference mission trip to Samara, Russia. But a life of faith demands good courage! God’s call often meets us where we are and moves us to places where we are not. 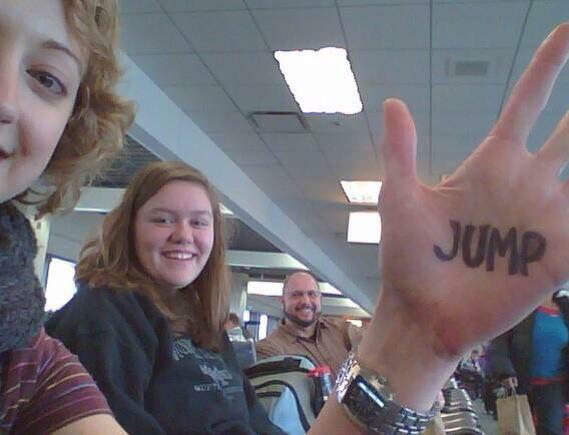 The picture associated with today’s post captures the enthusiasm Jay, Allison, and me carried along at the outset of journey together. Our smiles shine despite an unanticipated flight delay and worsening weather conditions; a questionable beginning to what proved an eventfully uneventful 40-hour trek halfway around the world. Given the circumstance, my prayers for smooth skies were hastily abandoned in favor of a more widely encompassing ‘safe passages’ theme… recognition that prayer delivers what we need, not what we want (though if You were to intervene with smoother skies during the return trip, Lord, I’d be much obliged!). The trans-Atlantic flight afforded viewing time enough for three popular films (yes, friends, there are now three current-ish films which I can speak to in conversation!). We laughed, explored, napped, and evaded security suspicions across three countries. I am thankful for Jay’s experienced leadership, Allison’s willing heart, and for all who travel with but not beside us – for your prayers, your support, and your love we are lifted!